Etsy stock will start trading tomorrow, April 16. Here's everything you need to know. What is the Etsy stock symbol? The Etsy stock symbol is ETSY and it is listed on the Nasdaq. What is the Etsy stock price? 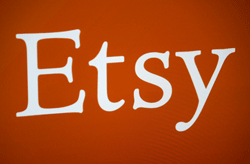 The Etsy IPO price – the price early investors will get shares for – will be announced tonight. It is expected to be in the $14 to $16 range. The Etsy stock price on its first trading today could be volatile. Many IPOs soar on the first day only to come back to earth shortly after. 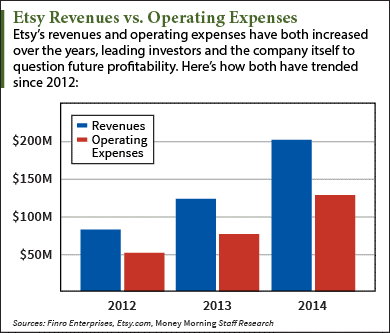 But Etsy might have trouble soaring because it has turned some investors off with its profitability issues. The "Etsy Weather Report" – which provides the company's monthly site-wide statistics – said advertising and payment processing make up nearly 80% of Etsy's revenue. Transaction and listings fees make up 55% of revenue and have grown 60% year over year since 2006. But expenses are high. That's why in its IPO filing, the company wrote: "We have a history of operating losses and may not achieve or maintain profitability in the future." How much is Etsy worth? Etsy is valued at $1.8 billion. How much will Etsy IPO raise? It depends on the Etsy IPO price, but it could be $250 million at the high end of the range. How exactly does Etsy operate? Founded in a Brooklyn loft in 2005, the company started as a way for its founders to sell handmade wooden crafts. Now, users buy and sell everything from art and photography to food and bath products. It has grown steadily over its decade-long history, with 54 million members, 1.4 million active sellers, and 19.8 million active buyers around the world. Etsy is a B Corporation – what is that?